Okay, actually the weather’s quite nice this afternoon, but the title’s still accurate, because there’s a “Dark And Stormy Night” Contest getting underway here at HubPages! Some of you may have read the results of the official Bulwer-Lytton Fiction Contest in one of those funny emails your grandma likes to forward all the time. (I should never have taught mine to use a computer.) In a nutshell, it’s an annual competition to write the most awesomely bad opening line for a novel that you can possibly think of… and then make it worse. 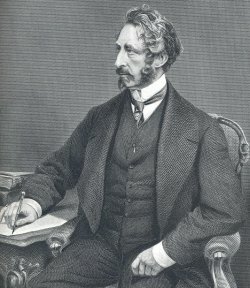 The original inspiration was an author named Edward Bulwer-Lytton (at right), who wrote the famous opening in his novel Paul Clifford. You can enter by leaving your worst-written sentence in the first comment box on the official Dark And Stormy Night Contest Hub. You’ve got until June 15th, at which point the HubPages staff will pick their ten favorites, and these ten will be put up on the hub with a voting capsule, and YOU will determine the overall absolute worst entry. There aren’t any prizes, except the joy of winning… and of reading all the other hilarious entries. The winner will also be entered in the Bulwer-Lytton contest later this year. So what are you waiting for? Get on over there and show us how bad you really are! Yeah, count me in, too. Actually, “It was a dark and stormy night…” isn’t that bad, it just got WAY OVERUSED! It became trite through familiarity. it was a dark and stormy night, I was fast asleep in my bed dreaming of better days, until I felt an weary presence that was unlike anything I had felt before. A short quick contest is just what I need to motivate me to get back into submitting to large writing contests again. Thank you.